After the historic West Virginia teachers strike that lasted nine days won a 5% raise for all public employees and a freeze to cuts in their health care, the teacher uprising has spread to Oklahoma, Kentucky, Jersey City and now to the Southwest. 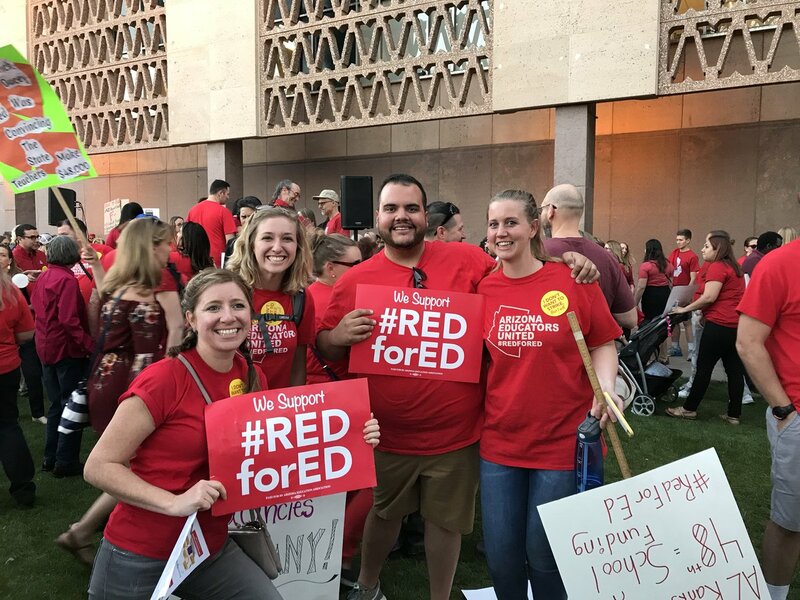 Arizona, ranked 50th in teacher pay by state, a state with nearly 2,000 vacant positions and where teacher absences go regularly unfilled due to a lack of substitutes, has held weekly “walk-ins” for over a month and is collecting signatures in support of their demands. At this year’s Labor Notes conference, Socialist Alternative spoke to Brittani Karbginsky, a rank-and-file union member and teacher leading the struggle. Since Labor Notes, the governor of Arizona has offered classroom teachers this 20% raise while giving nothing to support staff. Educators, emboldened by the massive concession, have continued organizing to fight for all members of their association. They’re arguing that replacing the nearly 1 billion in funding that’s still missing since the ‘08 recession, and getting a raise for support staff is a non-negotiable part of their fight. The teachers have also held a historic vote, with 78% in favor of Arizona’s first ever teacher walkout. What was most inspiring to you? That all of us, even when the district I work in just got a 5% raise, are fighting together. Many districts haven’t had a raise in 10 years! Even with the recent raise, at my current school we’ve gone through two other teachers in my grade level and might just now bring in a specialist teacher, who would be certified. What’s at stake for winning? The biggest demand is a 20% increase in pay. That being said, even with that, we would only move up to 49th worst state in teacher pay. As of right now, you could move out of our state to any of the surrounding five states and get about a $10,000 increase. So, cost of living may be lower than some places but that’s not a $10,000 difference in cost of living, unless you are moving to California. So that’s the biggest thing, starting off at 42 instead of 34 would attract more people. It’s a little better, not perfect, but it’s better. Monday we’ll go back, pretty much a normal day, for most people. For Wednesday, we will have our #RedforEd walk-in. We have 60% of schools walking in together in red. It’s not a walk out, we’re going to school, but want to show that we have community support, we have all the teachers on our campus in support of what’s going on. Basically, everyone meets at a central area, we go to a church next door and we all walk in hand in hand, arm in arm. However, that could change in about an hour. What would you say to someone across the country in the same situation, in the 49th lowest paid state, for example, but are afraid to go out because the union or media might be against it? What advice would you give them? Start small. We have done absolutely nothing illegal and we are a right-to-work state. If I walk out of my classroom i could get fired. However, if a majority of our teachers walk out, they can’t fire all of us, they literally can’t fill the classrooms. But I would start small. We started small with a Facebook group that almost got shut down. One person decided it was worth it and started it again on a Sunday and by Monday we had decided to paint the state red. That was the statement: we’re starting this. I think [we] had 50% in our school on those first days, but now almost everyone, maybe, wearing a red shirt, maybe just the shoes. As a leader, in the group there are 10 of us and we feel like if we would have just said “let’s just walk out,” we wouldn’t have had nearly enough support and would have gotten into trouble. And so were going into month #2 and we are just now planning, or talking about the possibility of the strike, because the governor has written us off. So we gave him an option, that he pretty much know he is going to say no, since he laughed in our faces and said 20% is never going to happen. Then he told us that we were lying, then the news proved him wrong. We are a red state, we have a lot of people who say we shouldn’t have chosen teaching, but I should be able to live if I do. I don’t want to make 100k, but I should be able to live and support myself in a 2-bedroom apartment, but those are $1200, and my paychecks are $1000 and a $1000. So what do you want to do this week, drive or sleep? You have to choose between a car payment and basic needs. In Arizona, you can’t be a teacher unless you live with someone or have another job, which most people do. Support is probably 80-85%. The final step that were in right now, is we’ve made an action plan that we are circulating. Once we have 30,000 people in support of Arizona teachers walking out, we will plan the walk out. Our slogan is “we don’t want to strike but we will,” so if we have to, we’ll do it for the kids, because we do care about the kids. Like, yes we we need the pay, but I have a dictionary that is 20 years old, literally falling apart, as a writing teacher but that’s just what we get. [When organizing,] just start small and build your way up. If they support you they support you, if they dont they don’t and if they say no, move on. Later, if they decide to join, they will probably regret not coming sooner because they’re going to see that we want something out of it that’s good for everybody, not just us.